These Cheesy Potatoes are total comfort food! 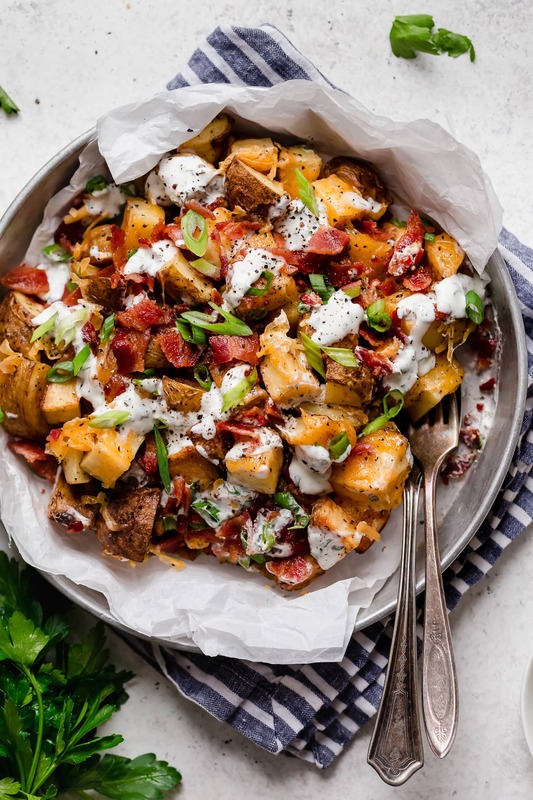 You get perfectly roasted, bite size potatoes covered with gooey melted cheddar, and they're finished with crisp bacon, homemade creamy ranch and fresh green onions. Simply put these are 100% irresistible! These Cheesy Potatoes are one of the ultimate comfort foods! Everyone in the family will go crazy for them. Talk about best way to turn a bland and boring potato into something seriously delicious! If you've ever ordered the cheese fries at a steakhouse then these will taste very familiar to you. I opted to use a lighter ranch dressing here but they'll also be delicious with a traditional ranch. And if you really want to splurge add in some extra bacon! Aren't you just drooling thinking about these things" They'll be a the best addition to your dinner menu, trust me. It will be like wait what main dish" I'll just take more potatoes, thanks.